Since its 2014 high on December 29, the S&P 500 Index has gained 1.5% (not including a fraction of a percent in dividends), the Dow Industrial Average has gained 1.3%, the Dow Transportation Average is down -5.8%, the Dow Utilities Average is down -8.9%, market breadth has churned sideways, and investment grade corporate spreads are flat (though junk spreads have come in about two-tenths of a percent). The Nasdaq has been the star performer, with a 5% gain driven by glamour tech and internet stocks. The last week of December, the NYSE registered 478 new highs and 72 new lows. Last week, with the S&P 500 registering a marginal record high, the NYSE registered only 198 new highs, with 118 new lows. Since December, in weeks when the S&P 500 has declined, NYSE trading volume has increased from the prior week by an average of 351 million shares. In weeks that the S&P 500 has advanced, NYSE trading volume has contracted by an average of 565 million shares. On broad indices, the general pattern resembles a narrowing wedge with a relatively flat overhead resistance area and increasingly shallow dips. What we observe here is a market that continues to struggle internally and shows persistent signs of distribution, but is still keeping its best foot forward, for now. While we don’t follow Dow Theory directly, we do find that its central principle of divergence and uniformity has enormous importance historically. In our view, the divergence and uniformity of observable market internals and credit spreads provides essential information about the risk-preferences of investors. Risk-seeking investor preferences allow markets to be tolerant of rich valuations and even bubbles, while a subtle shift to risk-averse investor preferences often signals an impending and catastrophic end to those valuation extremes. Indeed, if you ask what was the single most important factor in our own difficult narrative in recent years, it was that the methods that resulted from our 2009 stress-testing against Depression-era data, while including these measures, didn’t capture them strongly enough to tolerate QE-induced speculation. We ultimately had to impose those bubble-tolerant features as an overlay (see A Better Lesson than “This Time is Different”). Currently, we observe just the sort of internal divergences that our present methods demand as prerequisite to a hard-negative outlook. One example, from a Dow Theory perspective, is to note the classic divergence or “non-confirmation” here – a high in the Industrials with the Transports lagging, coupled with rich valuations and lopsided bullish sentiment. Beyond the signal for the financial markets, my impression is that this divergence suggests a continuing inventory buildup in the real economy (output being produced but not moving to distribution). Though the near term outcomes can be variable, we know quite a bit about how these instances have been resolved historically. The chart below offers a reminder. Among the recurring features of speculative episodes across history is the appearance of “new era” arguments to justify the elevated prices, coupled with arguments that historically reliable measures no longer apply. In our view, the problem is not that investors search for new, more reliable tools of market analysis – that should always be an objective. The problem is when investors adopt theories and models that embed the most optimistic assumptions possible, run contrary to historical evidence, or embed subtle peculiarities that actually drive the results (see, for example, the “novel valuation measures” section of The Diva is Already Singing). Eventually, the final refuge of speculation is to abandon historically reliable measures wholesale, resting faith instead on the advent of some new era in which the old rules simply don’t apply. “This time” is not different. There’s no question that investors have come to believe that somehow quantitative easing has durably changed the world – that central banks have (or even can) put a floor under the markets as far as the eye can see. But if you examine the persistent and aggressive easing by the Fed during the 2000-2002 and 2007-2009 plunges, it’s clear that monetary easing has little effect once investor preferences shift toward risk aversion –which we infer from the behavior of observable market internals and credit spreads. Monetary easing only provokes yield-seeking speculation when low-interest money is viewed as an inferior asset. It’s not monetary easing, but the attitude of investors toward risk that distinguishes an overvalued market that continues higher from an overvalued market that is vulnerable to vertical losses. That window of vulnerability has been open for several months now, and the immediacy of our downside concerns would ease (despite obscene valuations) only if market internals and credit spreads were to shift back toward evidence of investor risk-seeking. Zero interest rate policy has two effects on the financial markets. One is legitimate – every year in which short-term interest rates are expected to be zero instead of say, a typical 4%, should reasonably warrant a 4% valuation premium in stocks and bonds, over and above run-of-the-mill historical norms (one can demonstrate this using any discounted cash flow approach). So if investors expect short-term rates to be zero for another 4 years, it would be reasonable for stocks and bonds to be about 16% higher than historical valuation norms. At present, the most historically reliable measures we identify suggest that S&P 500 valuations are more than twice their pre-bubble norms. The other effect of zero interest rate policy is pure delusion. It is to convince investors that there is some miraculous support, "endlessly elaborated but never actually defined," that places a floor under the financial markets. By creating that delusion, investors become prone to “carry trade” speculation – buying any risky security that offers a yield better than zero. That carry trade mentality can only survive in a world where the possibility of capital loss is quietly assumed away. As it happened, yes, we were evidently among the only sane people on the planet. The S&P 500 went on to lose half of its value by October 2002, while the Nasdaq 100 lost 83% of its value. We expressed similar concerns (and projections of potential loss for the S&P 500) in 2007, which were validated in the financial crisis that followed. I can write this a thousand times, but we’re still regularly asked questions that implicitly assume that we’ve neither learned anything, nor addressed anything as a result our challenge in the recent half-cycle since 2009. I’ll say this again: our central challenge was not the result of our valuation methods, which didn’t miss a beat (see Why Warren Buffett is Right and Why Nobody Cares). Rather, the challenge was the inadvertent result of my 2009 insistence on stress testing our methods of classifying return/risk profiles against Depression-era data. The ensemble methods that came out of that effort, while performing even better than our pre-2009 methods in full cycles across history, also subtly reduced the impact of various components we use to infer investor risk preferences. The one thing that QE did to make things legitimately “different this time" was to reduce the overlap between overvalued, overbought, overbullish syndromes and corresponding deterioration in market internals. Because those syndromes were historically a reliable warning of subsequent deterioration in market action, we responded too strongly when they emerged. Put simply, QE made that overlap unreliable. We imposed overlays in mid-2014 that essentially rule out a hard-negative outlook until that deterioration in market internals or credit spreads becomes evident (as it has at present). Don’t imagine that our stumble in this half-cycle makes current market valuations any less breathtaking. 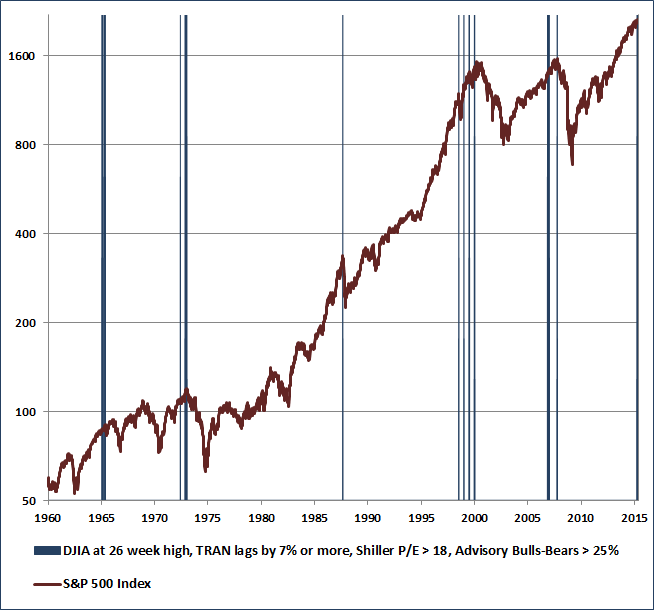 An advancing stock market is not evidence that stocks are not obscenely overvalued. If overvalued markets always crashed immediately, extreme overvaluation could never emerge in the first place. Instead, we have to ask a different question: what distinguishes an overvalued market that continues higher from an overvalued market that crashes? History repeatedly provides the same answer (which, like most discoveries, only seems “obvious” after you’ve figured it out). 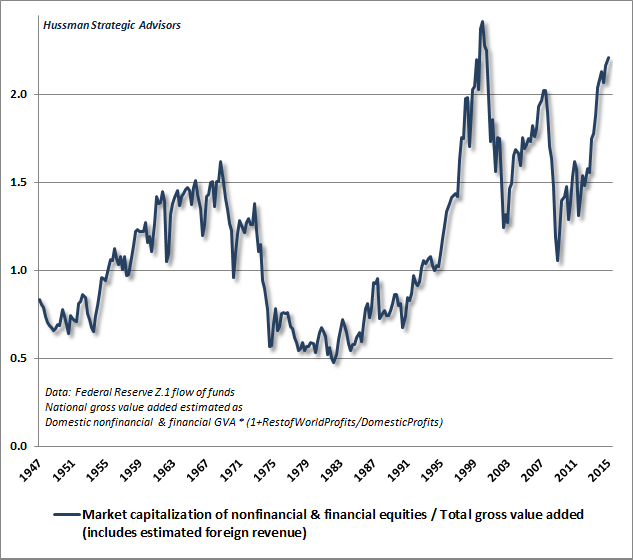 What distinguished the late-1990’s valuation bubble from the crash that followed that bubble? A shift in investor risk-preferences, as revealed by a subtle (and eventually profound) deterioration of observable market internals and risk measures. What distinguished the advance to the 2007 peak from the collapse that followed? A shift in investor risk-preferences, as revealed by a subtle (and eventually profound) deterioration of observable market internals and risk measures. The same is likely to be the case in the present instance, and on historically reliable measures, that shift has already occurred. Our concerns about market risk will become less immediate if they were to improve. At present, the market remains vulnerable to losses similar to those we observed in 2000 and 2007. Over the years, I’ve emphasized what I call the Iron Law of Valuation: the every security is a claim on an expected stream of future cash flows, and given that expected stream of future cash flows, the current price of the security moves opposite to the expected future return on that security. The higher the price an investor pays for that expected stream of cash flows today, the lower the return that an investor should expect over the long-term. What’s important for our discussion here is that there are essentially two ways to estimate the value of long-term cash flows. One is to explicitly model that future stream of deliverable cash flows, and the other is to choose some “fundamental” that is representative and proportional to that future stream and can be used as a “sufficient statistic” that summarizes the needed information in a single number. Where investors typically go wrong is to use current earnings or forward operating earnings as their “sufficient statistic,” ignoring the fact that profit margins vary widely across the economic cycle, making those figures notoriously bad choices (as they discover anew over the completion of every market cycle). 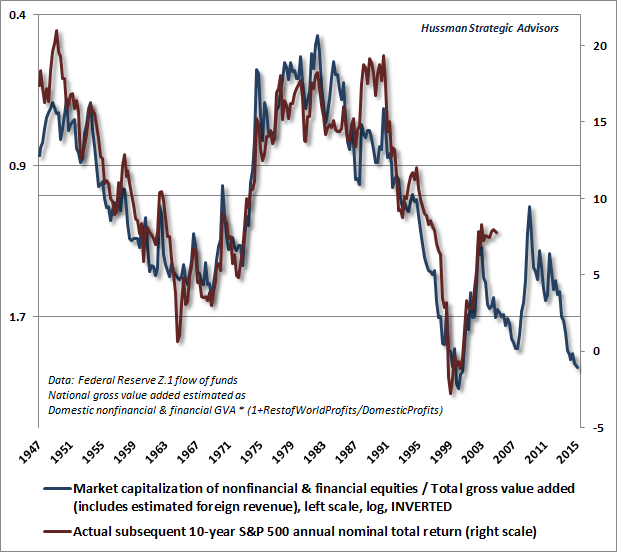 As we’ve demonstrated repeatedly, the valuation measures most strongly correlated with actual subsequent returns, particularly over a 7-15 year horizon, are those that normalize for profit margin variability in some way. In fact, the measure we’ve found best correlated with actual subsequent 10-year S&P 500 total returns is simply the S&P 500 price/revenue ratio (for more on these points, see Margins, Multiples, and the Iron Law of Valuation). Historically, we find that the least reliable market valuation measures are the Fed Model, the raw price/earnings ratio, and the forward operating P/E. The Shiller P/E (S&P 500 divided by the 10-year average of inflation-adjusted earnings) and Tobin’s Q (market capitalization to net worth at replacement cost) have substantially better records, with the ratio of market capitalization to nominal GDP and the S&P 500 price/revenue ratio having the best records (having a correlation with actual subsequent S&P 500 10-year nominal total returns of nearly 90%). In every period of speculation, investors begin to abandon historically reliable measures on the grounds that the world has changed in some way that makes these measures invalid. The main charge against market capitalization/GDP, for example, is that gross domestic product includes the income of foreign companies generated here in the U.S., and excludes the income of U.S. companies generated abroad. For that reason, some have argued that gross national product (GNP) should be used as the denominator (which counts the income of the nation, wherever it is produced). As it happens, because the various income components offset nearly identically, there’s virtually no difference at all in using one versus the other (GDP is currently $17.7 trillion, while GNP is $17.9 trillion). Unfortunately, taking the ratio of U.S. market capitalization to global GDP would be a wholly apples-to-oranges calculation, while global market cap to global GDP would say little specific about U.S. valuations. It seems to me that what’s really being asked is whether available statistics can account for the revenue of U.S. companies regardless of where that revenue is generated. As an alternative to GDP, we might prefer a valuation measure that captures corporate final sales generated domestically, plus the estimated final sales that U.S. companies generate in their activities abroad. The Federal Reserve Z.1 Flow of Funds statistics include figures for the “gross value added” of U.S. nonfinancial and financial companies, as well as the market capitalization of their equities. “Gross value added” or GVA is the value of output created across all producers in the economy, computed in a way that avoids double-counting of the intermediate sales used in the process. Looking at GDP from the production (rather than expenditure) perspective, GDP is essentially GVA minus sales taxes, plus subsidies. To address objections about international activity, we can expand GVA with an estimate of final sales that U.S. companies generate abroad. The key distinction is this. In national income accounting, “National” refers to amounts accruing to U.S. residents, regardless of whether those amounts originate within the U.S. or abroad, while “Domestic” refers to amounts originating here in the United States, even if they represent the production of foreign companies. “Rest of world” figures measure the difference between national and domestic. If the rest of world figure is available, we can simply add it to the domestic figure to obtain the national figure. If that’s not possible, we can still scale the domestic figure up by a factor of (1+rest of world X/domestic X) using some other variable X that’s reasonably related to the object of our interest. So here, we’ll scale domestic GVA up proportionally, estimating total GVA, at least to an approximation, as domestic GVA*(1+ rest of world profits/domestic profits). We take a 5-year smoothing of each profit series in computing that ratio. I should emphasize that this calculation is simply a way to expand the revenue base by including an estimate of U.S. revenue generated abroad. 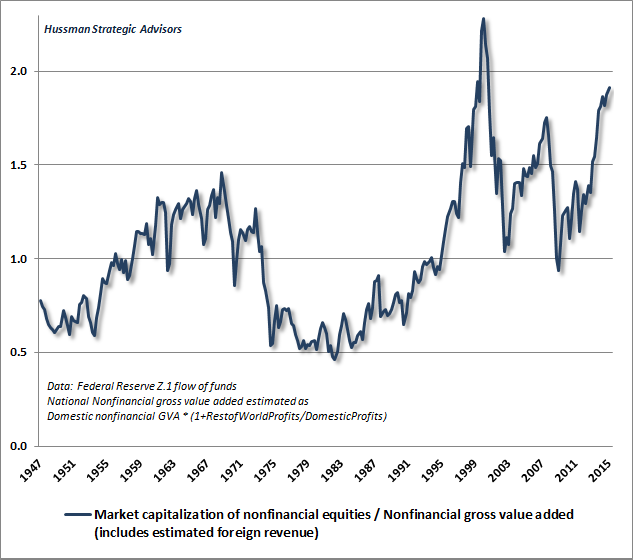 We present the resulting market capitalization / GVA measure in the chart below. We find that in market cycles across history, this new measure is better correlated (92%) with actual subsequent S&P 500 nominal total returns than even the S&P 500 price/revenue ratio and market capitalization/nominal GDP. Below, I’ve shown the measure for nonfinancial companies. The current level implies slightly negative total returns for the S&P 500 over the coming decade. Market cap/GVA including financial companies is equally correlated with subsequent market returns (92%), despite modest differences between the two measures, but implies slightly more negative total returns. As usual, the left scale shows log values (see Two Point Three Sigmas Above the Norm to see why). The following chart presents nonfinancial market cap/GVA on a regular and non-inverted scale, which offers some idea of how overvalued stocks are at present. The chart below shows market capitalization/GVA including both non-financial and financial companies. It may be surprising that including estimated foreign GVA has so little effect on our conclusions about overvaluation here. After all, we estimate that foreign GVA accounts for about one-third of the total revenue of U.S. corporations (which is consistent with what we actually know to be true for the S&P 500). This should reduce the ratio of market cap to GVA, and of course it does. The knee-jerk assumption is that this should also substantially change our conclusions about market overvaluation today, but it doesn’t. The reason it doesn’t is that foreign GVA didn’t just go from zero to one-third of corporate revenues yesterday. It was already about 20% of corporate revenues in 2000 and 25% in 2007. So when we include estimated foreign GVA, we don’t get to just reduce current valuation multiples by one-third and leave the valuations of prior years unchanged. 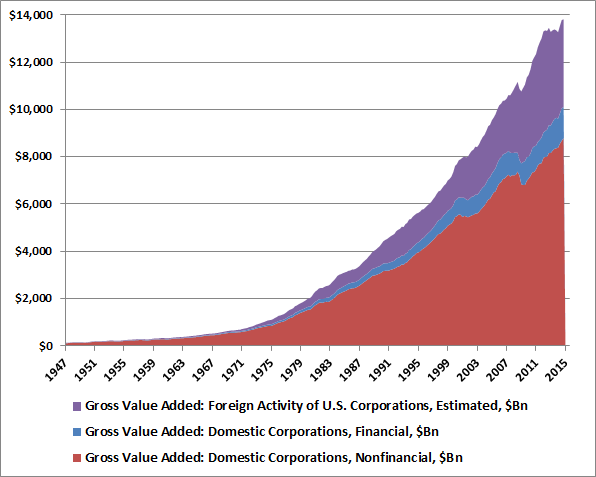 Yes, U.S. corporations generate more foreign-based revenues today than in the past. But looking over recent decades, that change has been fairly smooth, and on a relative basis, the effect on valuations is far more modest than investors seem to assume. Put simply, there’s no evidence to suggest that historically reliable valuation measures have somehow become irrelevant. The most reliable measures we identify in market cycles across history are consistent with the expectation of near zero total returns in the S&P 500 Index over the coming decade, and the likelihood that the market will fall by half over the completion of the current cycle. There will always be conceptual issues with any single valuation measure, so the best we can do is evaluate valuations from the standpoint of multiple historically reliable approaches. Across a range of those measures, we estimate that the S&P 500 is well over double the level that would be associated with historically normal 10% annual total returns. Even if we expected 4 more years of zero interest rates, that expectation would only justify a premium of about 16% over reliable historical valuation norms. A reminder on interest rate front - it’s essential to recognize that if one believes depressed interest rates “justify” extremely rich equity valuations, what one is really saying is that depressed interest rates “justify” dismal subsequent returns on stocks. This follows from the Iron Law of Valuation – the higher the price an investor pays for a given stream of expected future cash flows, the lower the long-term return one should expect. 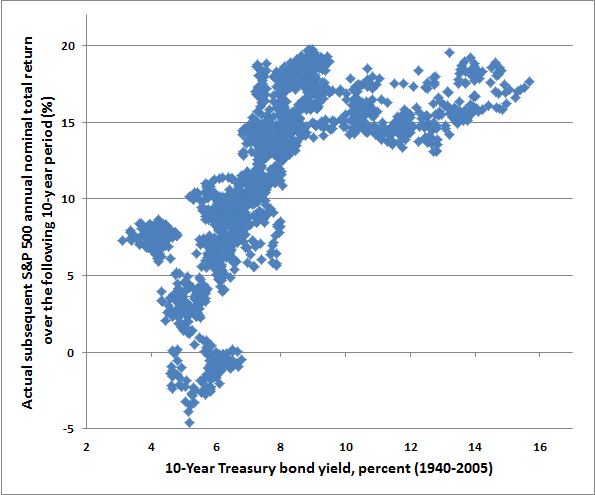 The following scatterplot of Treasury bond yields and subsequent 10-year S&P 500 total returns demonstrates this regularity, in data since 1940. Notice that to the extent that high interest rates were typically associated with depressed market valuations, they were also typically associated with elevated subsequent market returns. Moderate interest rates were associated with a whole range of subsequent returns over the following decade, and we know that those outcomes were 90% correlated with the level of valuations at the beginning of those periods (on reliable measures such as market cap/GDP, price/revenue, Tobin's Q, the margin-adjusted Shiller P/E, and others we've presented over time - see Ockham's Razor and the Market Cycle). Depressed interest rates were typically associated with weak market outcomes over the following decade, largely because investors reacted to depressed interest rates with yield-seeking speculation - driving valuations up and driving subsequent prospective returns down. While there is a general tendency for high interest rates to be associated with depressed valuations and above-average subsequent market returns, and for low interest rates to be associated with elevated valuations and below-average subsequent market returns, the relationship isn't extremely reliable or linear. The most reliable and direct indication of likely prospective stock market returns is not the level of interest rates but the level of valuations. The reality is that one doesn't need interest rates reasonably estimate 10-year prospective market returns, just as one doesn't need interest rates to calculate that a $100 expected payment in 10 years, at a current price of $65, will result in an expected total return of 4.4% over the coming decade. While stocks have a terminal value beyond a 10-year period, the effects of interest rates and nominal growth on those projections largely cancel out because higher nominal GDP growth over a given 10-year horizon is correlated with both higher interest rates and generally lower market valuations at the end of that period. As a result, starting valuations, on historically reliable measures, are 90% correlated with actual subsequent 10-year total market returns. Simply put, one might believe that short-term interest rates will still be zero a decade from now, but if that's true, it will be because nominal growth over the intervening period has also been dismal. In that case, the stock market would still be expected to post a total return of roughly zero, even if valuation multiples only revert partially toward historical norms. Interest rates come in after one estimates prospective returns, and can be used to decide whether prospective equity returns seem dismal, competitive, or attractive by comparison. But regardless of the answer, recognize that extremely rich valuations will still be associated with dismal long-term expected returns. In short, given currently extreme valuations, the most historically reliable valuation methods instruct us to expect total returns of roughly zero for the S&P 500 over the coming decade. If one believes that depressed interest rates “justify” obscene valuations and associated expected returns of roughly zero for the S&P 500 over the next 10 years, then one is quite free to call stocks “fairly valued” – it’s just that those “fairly valued” stocks are still likely to go nowhere over the coming decade, with some spectacular interim losses along the way. The difficult aspect of the present market environment relates to the near-term. The combination of wicked overvaluation coupled with deterioration in market internals places current conditions among the most negative market return/risk profiles we identify (occurring about 8% of the time across history, frequently with vertical losses emerging in those periods). Still, we recognize the psychological perception that Fed easing somehow puts a “floor” under stocks – however contradictory that perception is with history, and even with the 2000-2002 and 2007-2009 plunges. An improvement in market internals and credit spreads would indicate a resumption of that speculative “meme” and would, despite obscene valuations, reduce the immediacy of our downside concerns. Even in the absence of such an improvement, we have to be patient with what we continue to view as a broad distribution pattern. It is unwise to rule out a market collapse. Recognizing that vulnerability does not force one to forecast or rely on a crash, but it strongly argues that market risk should be avoided (or accepted in strict accordance with one’s investment horizon and tolerance for loss). We encourage patience for less severe conditions. Our views will change as the evidence does.